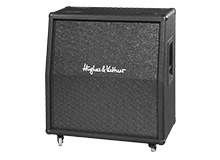 My first encounter with Hughes & Kettner was at a British music show back in the late ‘80s. I heard these great sounds coming from a stand apparently being produced by a young blonde boy, who, of course, turned out to be a very youthful Thomas Blug. At the time, I was demoing for that other amplifier company (you know the one), but I always maintained an interest in Hughes & Kettner and also watched Thomas develop into the superb player he has become today. Around the time that I parted company with that other amplifier company (2006? 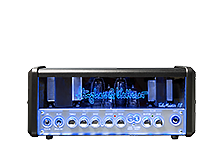 ), Hughes & Kettner introduced the Switchblade, which to me seemed like the answer to a lot of prayers. Up until then, I had been either using a multi-amp setup or a rack system, both of which were a pain in the a**, to be honest. The Switchblade provided an ideal solution, and I have toured and recorded with one ever since. I also use the (sadly discontinued) Statesman combos, and the Rotosphere (the best Leslie simulator ever) is very much an integral part of my sound. So, thank you, Mr. Hughes and Herr Kettner. You’ve made an old(ish) man very happy.